The New Year, Capodanno (head of the year), falls right in the middle of Italy’s Christmas season, which ends with Epiphany on January 6, and is celebrated with very high spirits. You know the date is approaching when red underwear stalls open in the markets. It’s traditional to wear red underwear for luck on New Year’s Eve, and it must be new. Today, bikinis and thongs (for both men and women) top everybody’s list. It boggles the mind to see red thong underwear in size XXL. Food plays an important role in New Year’s celebrations, too. Traditionally, people eat lentils and pork sausage. Lentils represent wealth, their round shape echoing coins. The superstition is that the more lentils you eat, the more wealth you will see in the coming year. The sausage is consumed in one of two forms: cotecchino or zampone. Both are made from a similar sausage mixture. The cotecchino is packed is a casing that’s about three-four inches in diameter (eight-ten centimeters). 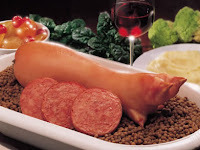 The zampone is stuffed into a pig’s foot. And it’s all washed down with Italian bubbly, spumante or prosecco. Restaurants offer cenone (big dinners). Music plays a big part in celebrations, as well. Throughout the evening, there are free concerts in piazzas with people dancing in the streets all over Italy. Additionally there are classical concerts in auditoriums. One of the most popular concerts in Rome features gospel music. On New Year’s Day, a parade of bands coming from around the world marches to St. Peter’s. One tradition, dominate in the south of Italy, involves throwing something old out the window at midnight. The idea is that you chuck bad luck out with the old year and face the new year with a new beginning. I’ve been told that people used to throw large pieces of furniture and other things that could prove dangerous. I once tossed out a chipped cup, but I made sure no one was standing underneath in the street. One young American friend, who was about nine at the time, heard my Italian New Year tales and asked if people threw out their old red underwear, since you must have new for the luck to be good. I chortled for a year, but just couldn’t bring myself to toss that out the window. Fireworks displays explode across the boot at midnight. In Rome the major display is in the Piazza del Popolo, but there are other fireworks, as well. Along the coasts, boats light up their riggings on New Year’s Eve. And in Florence, the best views of the fireworks in on the bridges. Naples is famous for its fireworks, which explode over the bay. In Bologna, the Rogo del Vecchione is the evening’s highlight. 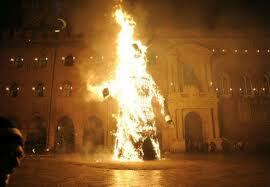 After a night of music and dancing, a large effigy of a man representing the old year is burned at the stake in a Piazza Maggiore. In the south of Italy, people sometimes fire shots into the air at midnight, and everywhere kids toss firecrackers until well into the next day. It sounds fun, and lentils are definitely better than the black-eyed peas we eat for luck. Firecrackers seem to translate well--we have loads of them in our neighborhood (our poor dogs hate them). I'll borrow from Italy selectively--pass on the underwear but make lentil soup this year. If money follows, all the better. Hi, Ellis. I usually do something combining lentils and black-eyed peas, my southern legacy. I always cook them both, and look for ways to combine them. Auguri! The Italians do know how to throw a party! :) This sounds like so much fun. I love lentils and cook them all year round. In Iran, they eat them for breakfast with lemon, dried angelica and olive oil. I'd like to start a tradition of throwing old things out the window, but I'm afraid my neighbors might object. What fun! I wish I were in Italy for Capodanno! The Italians do know how to celebrate. Thanks for this very fun post, Patricia. Heidi and Kaye, thanks for your comments. It is a heady time, but I must admit that I get tired of the firecrackers that are still popping the morning after. Thanks for telling these stories - I just watched Cinema Paradiso and wondered what was going on at midnight! Lovely. One of my favorite movies. Nuovo anno sera è l'unico più bella serata in tutto l'universo e pubblico vuole godersi il nuovo anno sera. abbiamo arainge il nuovo eveing anno a Bologna 2016. Nella straordinaria cornice di Corte Isolani, A Due Passi Dalle Due Torri, proprio al centro di capodanno bologna, trascorri il capodanno Più straordinario del 2016.